Good News for a Wretched, Miserable, Poor, Blind, and Naked Church! When I was cold I wanted to go get a blanket and change my situation. As I laid there shivering I sensed my need. Lukewarm people don’t sense their need of anything. They have no desire to change their situation. But how can we be lukewarm when Jesus knows we have good works? When we do good deeds for others it “warms” their hearts. Malachi 4:2 talks about the Sun of righteousness. The Bible likens righteous deeds with heat. In John 3:19 as well as other places, the Bible likens evil to darkness, which without light or heat is cold. I go and see grandma in the nursing home every week and that is good. That is hot. But the only reason I go is to make sure I’m in her will, which is dark and cold. So in the end, after seeing grandma I am just lukewarm, and my hypocrisy makes Jesus so sick He wants to throw up! See Revelation 3:16. Why does Jesus say to buy the gold and white garments? Isn’t salvation free? Jesus is referring to the bartering system. He wants us to trade in our self-righteousness which makes Him want to throw up, in exchange for His robe of righteousness. He wants to take self out of righteousness since it is self that makes righteousness lukewarm. Lukewarm is not the absence of good works. It is the presence of self. Its hard to sense our need of Jesus when we are full of ourselves. But if we find our self-righteousness unappetizing, and hunger and thirst for Jesus’ righteousness (See Matthew 5:6) He will come into our hearts and dine with us and feed us His own righteousness. 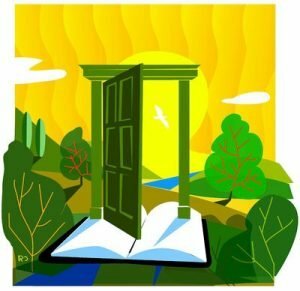 Remember the door in heaven, in the message to Philadelphia? That door was open. Heaven’s doors are wide open. But when Jesus comes to Laodicea, He finds a heart that has works, but is so full of self it has locked Jesus out! Heaven’s door is open but Laodicea’s door is closed. When Jesus came to earth He was born in a stable because there was no room for Him in the inn. Later Jesus tells us there is plenty of room for everyone in His Father’s house. (See Luke 2:7 and John 14:1-3). Heaven has plenty of room. Heaven has an open door. If we are lost it’s because we had no room for Jesus and our heart’s door was closed. Jesus hasn’t given up on Laodicea. He hasn’t given up on us! He has high expectations for His lukewarm, poor, miserable, blind and naked church! There is wonderful news for a wretched, poor, miserable, blind, and naked church that recognizes it is cold and needs a Savior. Jesus stands at the door of your heart. Open the door. Give Him your rags, which only make you lukewarm and still leave you naked. He will clothe you with His robe of righteousness, so you won’t have to be cold, miserable and naked any longer. Heaven’s door is open. There is plenty of room. What do you say? The church of Philadelphia represents the church that found the open door into the Most Holy Place in 1844. This church also found a book open that had previously been sealed. If the details in Revelation 10 follow the fall of the Ottoman Empire in 1840 in Revelation 9, then the time period is around 1844, when the book of Daniel became an open book and the time of the end began. Revelation 10:4 says that John was getting ready to write something down that the Thunders spoke, but was told not to write it. What did they say and why was he told not to write it down? Obviously I have no clue for sure! But I do have an idea. In Revelation 10:8-10 John is told to eat a book that tasted sweet in his mouth but turned bitter in his stomach. Many believe that refers to the great disappointment in 1844 when people misunderstood that Jesus was coming to earth instead of going into the Most Holy Place ministry which had just begun. I wonder if the Thunders told John about the great disappointment, but he was told not to write it down? If I happen to be right, why would they tell him not to warn everybody so they wouldn’t be so disappointed? Because some things have to be learned by experience. Sometimes we have to experience problems personally so we can work out the solution clearly in our minds and see why that is the solution. Most math books have some or all of the answers in the back. But it is not enough to just write the answer down. The teacher wants to see your work. She doesn’t just want you to know the answer, she wants you to write out and work out the problem so you know why it is the answer. The Bible tells us Jesus is the answer, but we encounter problems in life so we can know why Jesus is the answer. God wanted his precious church represented by Philadelphia to work out the prophecies of Daniel and Revelation so they would know by experience what the answer is, instead of just reading what the answer is. Now back to the open door. While many believe the door is the door into the Most Holy Place, other scholars point at doors of evangelism that were open in those days. The American Bible Society was opened in the early 1800’s in Philadelphia, Pennsylvania, of all places! Publishing and spreading sacred literature became easier during this time. Add to this that when Jesus said, “what he opens no one can close, and what he closes no one can open,” I don’t think that applied to just one door. I think that is true about any door. If anyone has ever closed a door of opportunity on you, you can be sure of this, Jesus never opened it for you! If He had opened it for you no one would have been able to close it. No matter how things turn out for us we can be sure that man does not control our destiny. The same hands that were nailed to the cross and turned around and opened the seven seals holds our destiny. It is also interesting that the church of Philadelphia is shown an open door in heaven, yet later when Jesus comes to the church of Laodicea He finds a closed door. If we are lost it won’t be because Jesus would not open heaven’s door. Heaven’s door is open. If we are lost it will only be because we would not open our heart’s door to Jesus. Next time we will take a look at the message to Laodicea.